Georgia-measles: Atlanta hospital dealing with first case of measles since 2012. 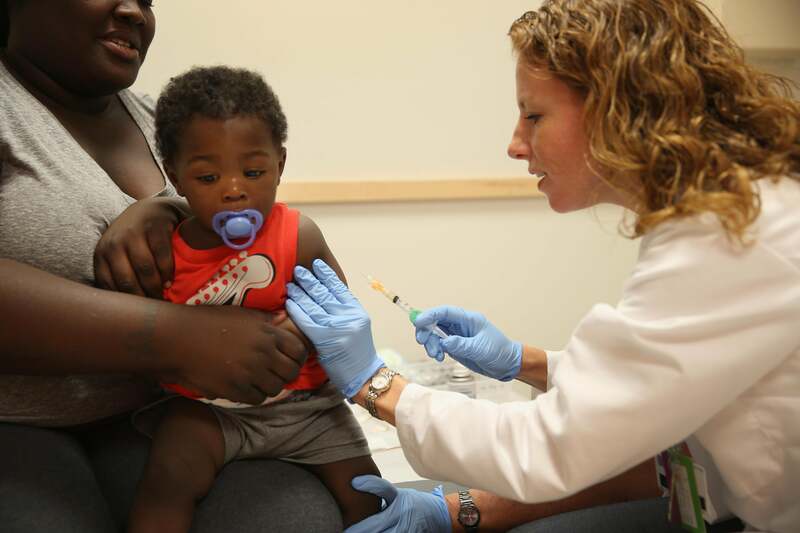 A 1-year-old gets a measles vaccination on June 2, 2014, in Miami. Georgia health officials on Monday announced that the state is dealing with its first reported case of the measles since 2012. The patient is an infant who arrived from outside the United States, according to the state’s Department of Public Health. Georgia officials say they are teaming up with the U.S. Centers for Disease Control and Prevention to ID anyone who may have been exposed to the patient, who is currently being treated at an Atlanta-area hospital. This is the 11th reported case of the measles in Georgia since 2002. All 11, according to the state, were “imported cases or linked to an imported case.” While this particular case appears to be unrelated to the recent outbreak that has been traced to Disneyland in California, it nonetheless comes at a time when the public health community is becoming increasingly concerned about outbreaks of the highly contagious respiratory disease. Measles is dangerous yet nearly entirely preventable. It can spread when an infected person breathes, coughs, or sneezes. While there is no cure, it can be prevented through vaccination. MMR, as the measles vaccine is known, is highly effective, getting the job done in about 97 percent of cases. The disease, however, poses particular danger for infants, who cannot be vaccinated until they are at least 6 months old. The disease was declared eliminated from the country in 2000 thanks to widespread vaccine coverage. In the decade and a half since that medical victory, though, a statistically significant number of parents have refused to vaccinate their children. The anti-vaccine movement, in the words of the New York Times (emphasis mine), “can largely be traced to 1998 report in a medical journal that suggested a link between vaccines and autism but was later proved fraudulent and retracted.” There have been confirmed cases in more than a dozen states this year, and the nation has already seen more cases since Jan. 1 than the total number typically diagnosed in a full year.